Here’s a lesson: No matter how much you cook, read a recipe through to the end before you begin. I did not do that when I first made this dish. I was cocky, and chatting (with Susan! ), and…I completely blew the orange sauce. If I’d paid attention, I would have realized that it was a sauce buerre blanc, and I would have paid more care to both the heat and the rate at which I whisked in the butter. The sauce wouldn’t have broken, Vincent wouldn’t have noticed that the sauce was broken, I would have been much less embarrassed, and I wouldn’t have had to prepare the dish for a second time. But here’s the thing: We learned a lot preparing the dish a second time! I included more notes in the recipe below so that you don’t make the mistakes that I did. We learned that if you focus on achieving a nice golden crust on one side of the the scallops, proper doneness will pretty much take care of itself. We learned that it is no problem whatsoever enjoying this dish twice in one week because it is absolutely delicious. Given several work-ahead components, this dish would be lovely for a relaxed spring dinner party. 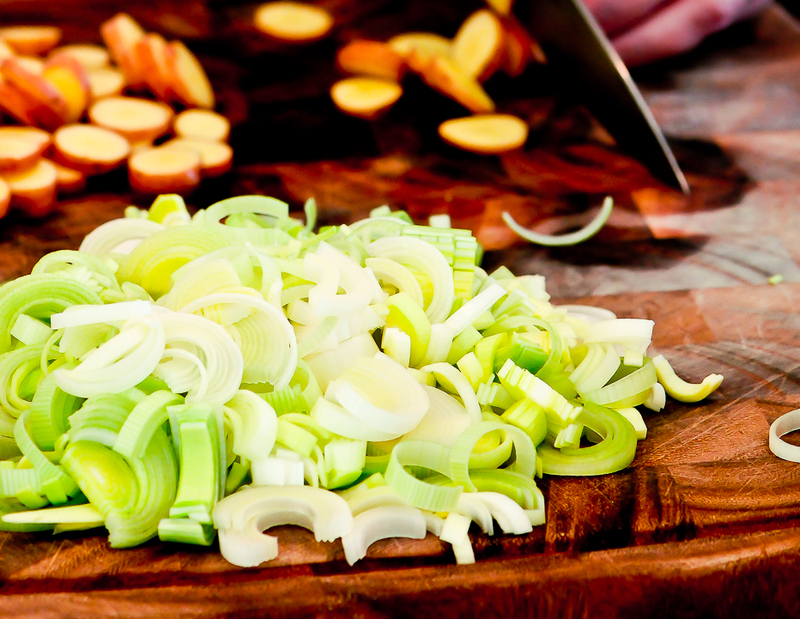 Preparing the leeks and fingerling potatoes. 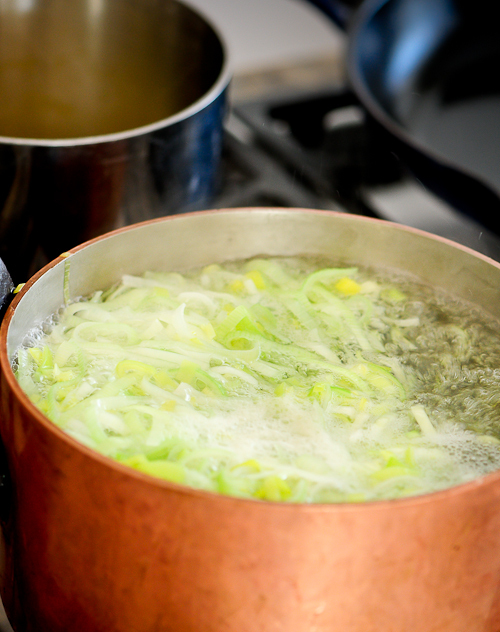 A quick blanch for the leeks and it is off to the ice bath. One of the great do ahead steps. Searing the scallops to perfection. Waiting to be made into the fabulous buerre blanc. 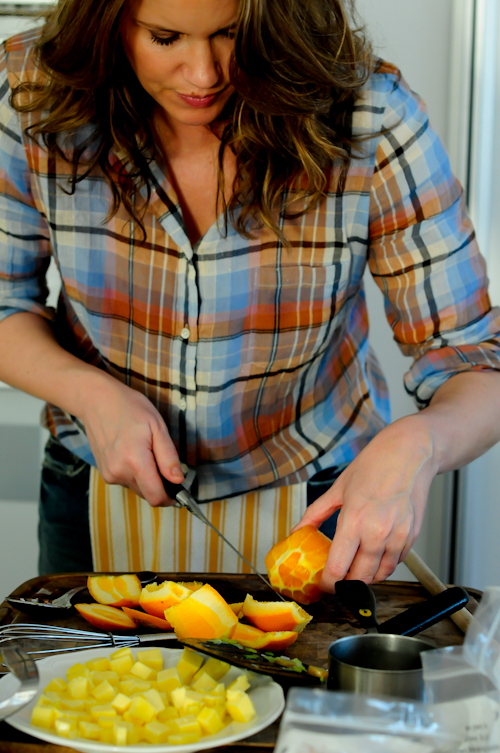 Stephanie having her way with the oranges. Preheat oven to 400 degrees F. Prepare an ice bath for the vegetables by filling a large bowl with cold water and plenty of ice. 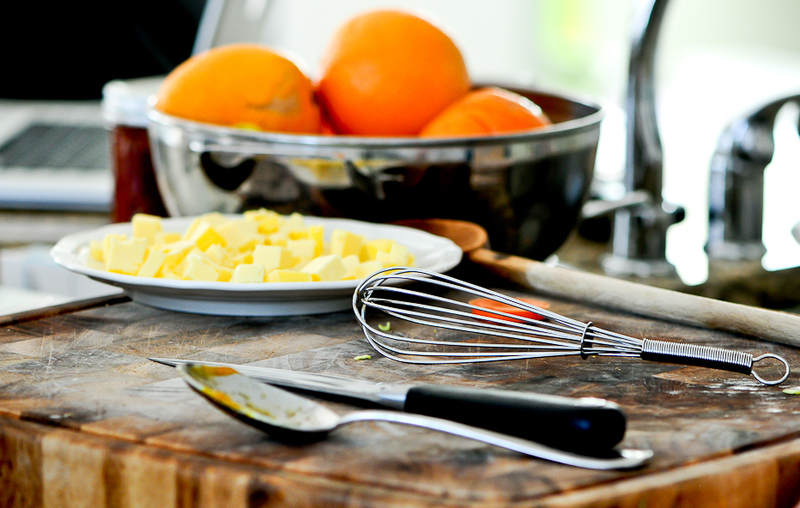 In a small saucepan over medium heat, simmer orange juice, stirring occasionally, until reduced to about 4 Tbsp. Texture will be syrup-y. (Can be prepared up to 2 hours ahead; set aside at room temperature. Bring to a simmer before continuing.) Turn heat to low and whisk in the butter, one piece at a time, until butter is completely melted. Continue whisking in butter until all is incorporated and sauce is smooth and glossy. Add the vinegar and season with salt and pepper. Remove from heat and set aside. Season the scallops with salt and pepper and coat only one side of each scallop in flour. Over high heat, warm a large, oven-safe skillet with oil; when oil is smoky add the scallops, flour side down to the pan (do not overcrowd the pan) and transfer to the oven. Roast the scallops for 4-6 minutes. 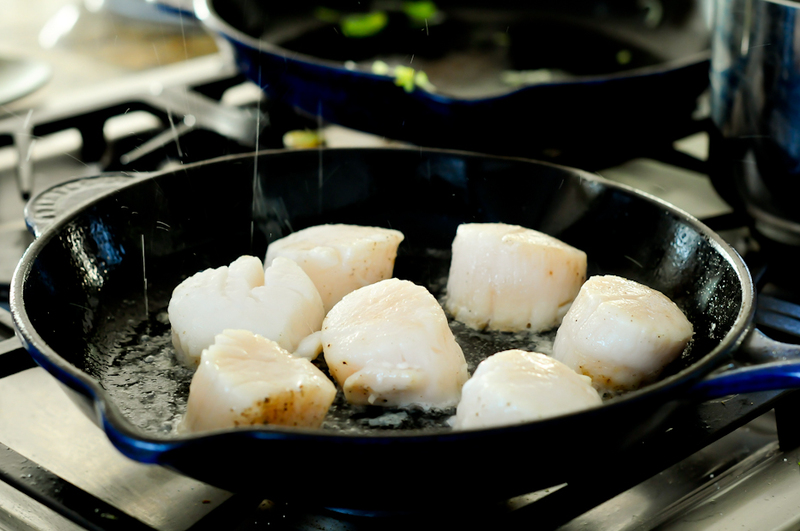 Return the pan to a medium-high burner and have a look – if the scallops are nicely browned and crusty, flip the scallops and sear for 1 minute. If they’re not quite brown enough, sear them for a minute or two and then flip them for a minute. While the scallops roast, heat another large skillet over medium heat. Add the butter and when it melts, stir in leeks and potatoes. Stir to coat in butter and to warm through. Season with salt & pepper to taste. 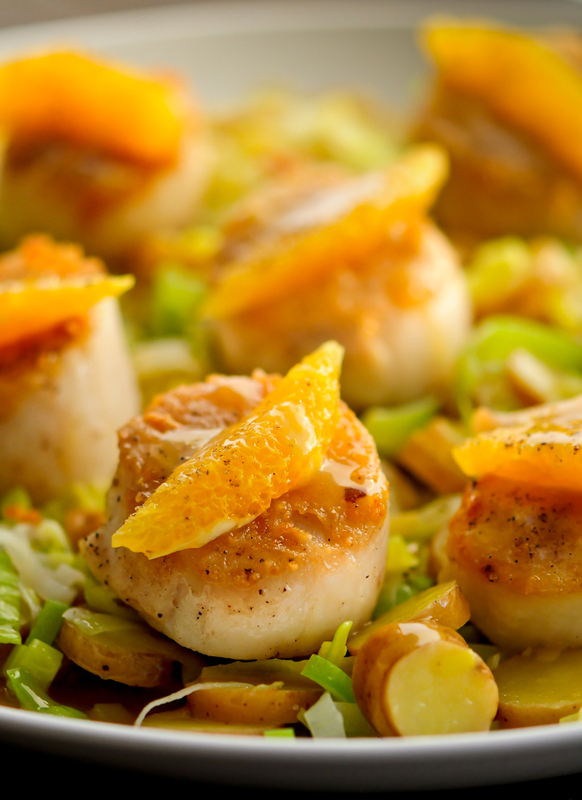 Serve scallops on top of potatoes and leeks. Drizzle with sauce and garnish with orange segments. We paired this delicious dish and celebrated the launch of “Shooting the Kitchen” with a beautiful bottle of Veuve Clicquot. Perfect. Wish I could be there to savor this dish! Looks fabulously delicious! Wonderful, wonderful, wonderful!! No wonder you two have been so excited. This is going to be so much fun. Can’t wait to see where you take us next. Yay!! Lovely photography, great writing. Very excited to follow your travails. Love seeing what all the fuss was about, and my, it sure was worth the fuss. Love this, Steph! Simply incredible! This recipe is dangerous, as it could easily knock me off my raw vegan wagon! The photography is phenomenal. Makes me want to reach into my monitor and grab a bite (or a plateful)!! Fabulous!! You guys!!! This website is off the hook! I’m at a serious loss for words! To top it off, you went and got the recipe for my favorite of Vincent’s dishes! I’m really looking forward to see what comes next! Wonderful descriptive commentary and fabulous photography. I’m really hungry right now! 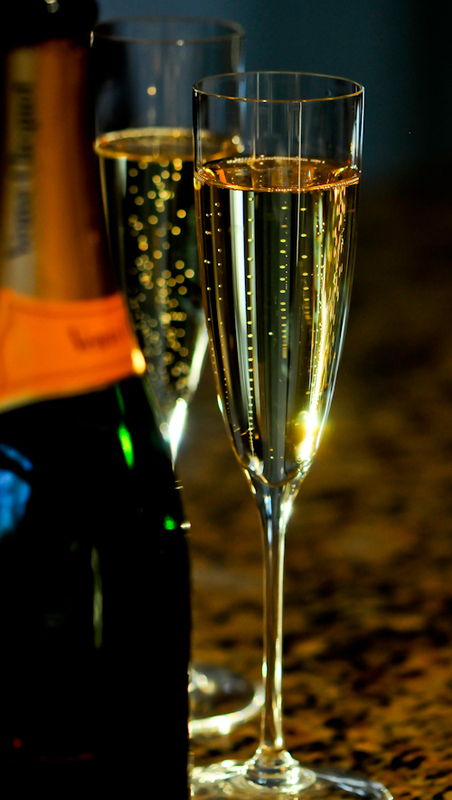 Congratulations, Susan, on your stunningly wonderful new adventure!!!!! You have so many delightful, complementary talents. I look forward to seeing more of “Shooting the Kitchen”. Are you kidding me with these photos?! Wow wow wow. this recipe on the web, with Stephanie and thanks to Vincent. Questions: Why Wondra flour and why so much? To coat the scallops in flour does not require so much as a cup. Could one do it with regular flour? I purchased Wondra for this recipe and wonder how to use it again. I think I over cooked the leeks and potatoes by just a smidge, still the taste was very good. As to searing the scallops I think it takes practice so as not to over do them but to have that seared look. Mine were not seared as I have seen in restaurants, still they were good and not over done. Also, how about a suggestion as to the kind of “high heat oil” and how much.